Hi, I'm Jake, sorry it's taken me so long. So five days ago my parents Greg and Michelle flew here to Chicago. This was going to be the second time both sets of parents were together. Last year Kelly's mom, dad and brother flew out west to Seattle, and of course the day they flew in, I had to fly out to LA. I was gone for all but one of the days they were in my hood. So Kelly had to oversee the meeting and partying of the parents. My brother and his girlfriend were also there. So everyone but me got to hang out. That's probably why they had such a great time; just kidding they were probably miserable without me. Instantly the dads hit it off and were inseparable the entire time. So this time around I was involved. They arrived Thursday and went home Monday. Plan was to show them all that Chicago had to offer. I believe we did a pretty good job of doing just that. Although now that I think about it we didn't get a tour of the Arch. So the entire trip was a wash.
We really had an awesome time and I got to hang out with the parents more than just a couple of hours like last time. On Thursday us guys played some golf and the ladies went to check out the church and reception hall. So for the last five days we have been cramming the days full of things to do. 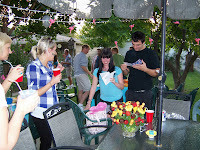 We had a great engagement party/meet the parents party on Saturday night. Lots of friends and family came over and met the Wambolds. My future Mother-in-law got way out of control and had a little too much fun, but we got some rope and got her calmed down. So I have to tell you how blessed I am on top of having an amazingly beautiful fiancee, I have such great parents, all four of them. It's incredible to watch your father and future father become such amazing friends, while mom and mom laugh about how funny it is that the dads have crushes on each other.